What is Hospice Music Therapy? Improving quality of life is the over-arching goal for every hospice patient. 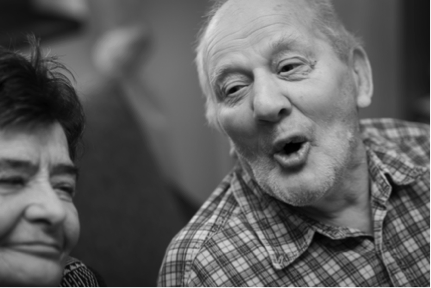 Music therapists bring beautiful experiences into the lives of hospice patients, providing music interventions that bring relief, engagement, interaction, reflection and fun! Music therapists use a variety of music interventions to meet those needs. Music interventions are tailor-made to fit each person in that moment by taking into account a person’s cognitive abilities, physical condition and personal preferences. Joe, a hospice patient with CHF, feels that he has no control over his life and often feels depressed and powerless. The music therapist puts him in charge of choosing the content of his weekly sessions, and he chooses to sing. The music therapist offers a selection of songs, starting with those that match his current emotional state, and slowly changing them to increasingly upbeat songs. As he chooses from this gradually changing selection of songs, he not only feels empowered, but the change in the tempo and feel of the music bring about positive changes in his own emotional state. “Music therapy has been a life saver to me. It has brought me out of the gutter, woke me up, made me see the sunshine instead of the clouds”. Click here to see current research on music therapy in hospice care.